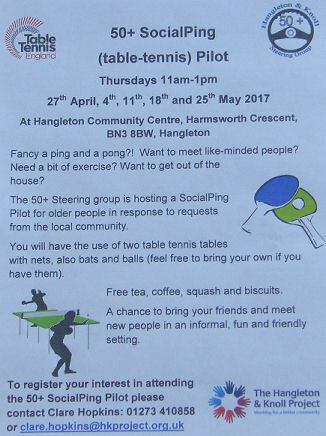 The Hangleton & Knoll 50+ Steering Group has worked with local table tennis player Brian White and Valerie, who manages the Community Centre, to set up a pilot of five SocialPing (table tennis) sessions on Thursday mornings from 11am to 1pm. We hope that the response to the pilot will be such that it will then become a regular event. 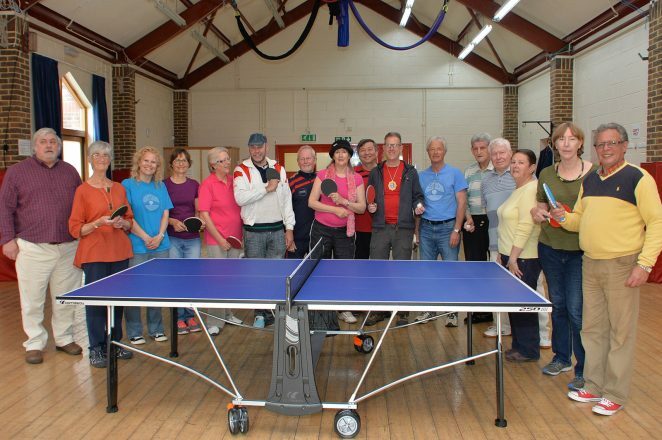 We have been helped enormously by the Brighton Table Tennis Club: Ian Fowlds and Wen Wei were kind enough to help us with the first session, showing us exercises to do to limber up then giving a demonstration of how it’s done by experts. And things are looking good with 12 people (including the Mayor) turning up and having a great time playing doubles no matter what their abilities.